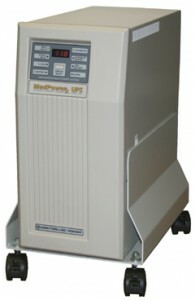 Medical Grade UPS | Powerco™ Canada Inc. The MedPoweRx UPS – Patient Vicinity Series, Model LT/M is a single phase, seamless transfer, UL 60601-1 listed, uninterruptible power system (UPS) for use with patient vicinity medical equipment such as: fluoroscopy, patient monitors, ultrasound and other critical medical equipment. The MedPoweRx not only protects sensitive medical equipment from power outages, but it also regulates voltage, attenuates harmonics, and eliminates line and ground noise. Steady, regulated voltage to +/- 3% provides proven performance and extends the life of your equipment. Low leakage current to ground for patient vicinity use. Highest-level performance sinewave output matches your system’s requirements. Field-expandable power ratings, and optional extended battery runtimes. Built-in, medical-grade, power purifying isolation transformer protects the load from even the most-damaging power disturbances. User-friendly status and diagnostic indicators. “DataGuard Advanced” option for network UPS monitoring.